Morning clouds burned off to reveal a dazzling, blinding world of pure blue sky above and fresh powder snow below our feet. 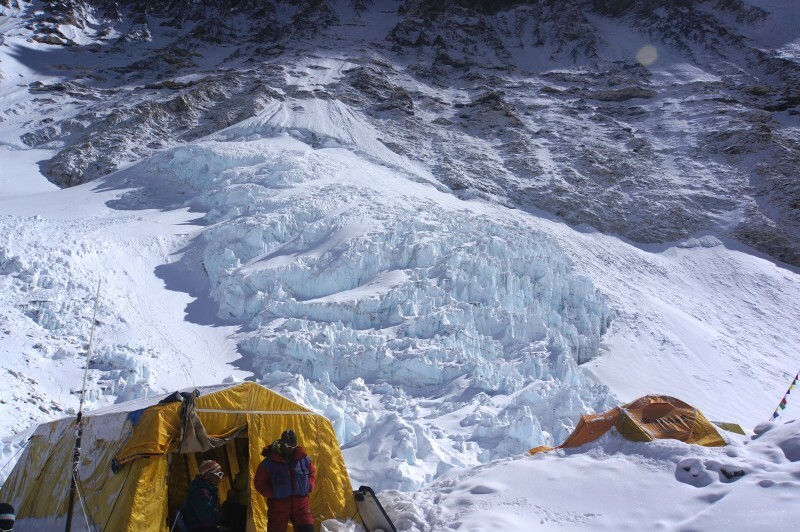 Lhotse looked very different cloaked in white: more beautiful, clean, and benign than it had from C1. 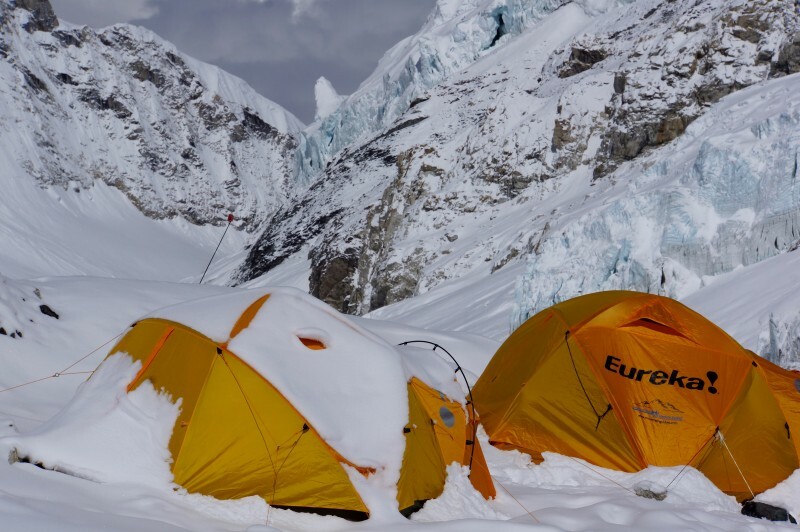 Our yellow tents stood out in sharp contrast to the pure snow, the jet black basalt of Everest’s West Ridge, and the intense blue of the hanging glaciers. 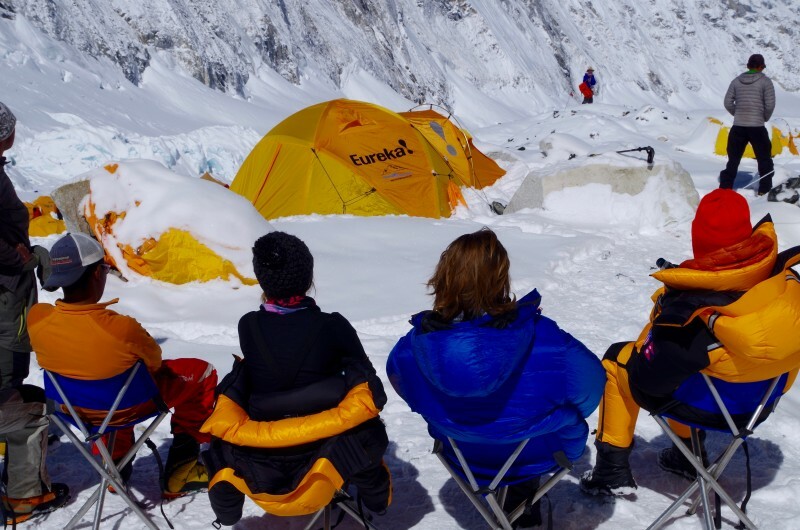 We pulled folding chairs out of the dining tent and lined them up on the snow, facing down the valley, and took in the incredible views. There was little to do but sit, wait, and watch the cwm and the modest activity at C2. 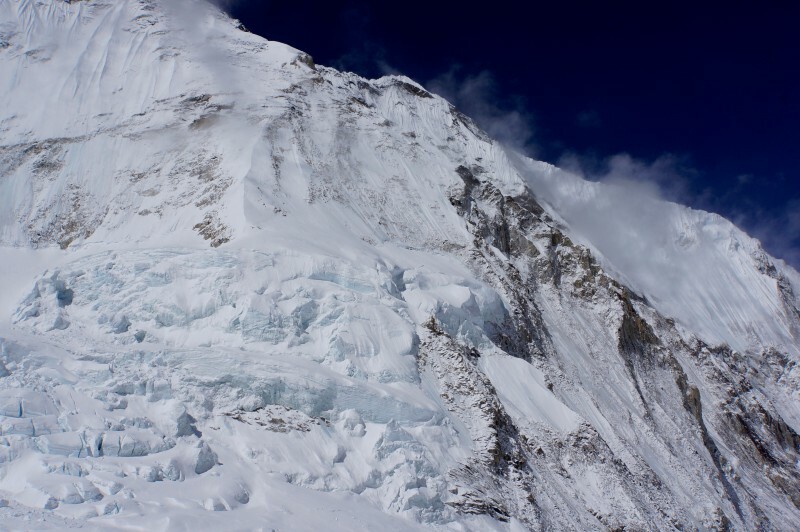 We were at the top of the established route, but looking up at Lhotse we could see where C3 was supposed to be. The face is very steep, and very austere. And, we all felt the same way: We can do this. Dazzling sunshine and a front row seat to the top of the world. Kim and Blake at C2. 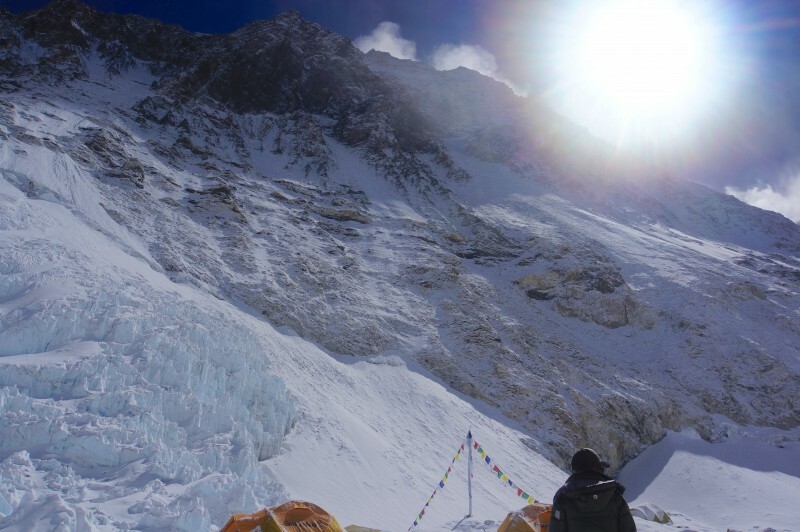 Panorama from C2 of Lhotse and Nuptse. Same view, just looking lower to include C2 itself. Last part of the 360 panorama, including our camp in the foreground, another camp in the distance, and the west shoulder. View just above the last image. 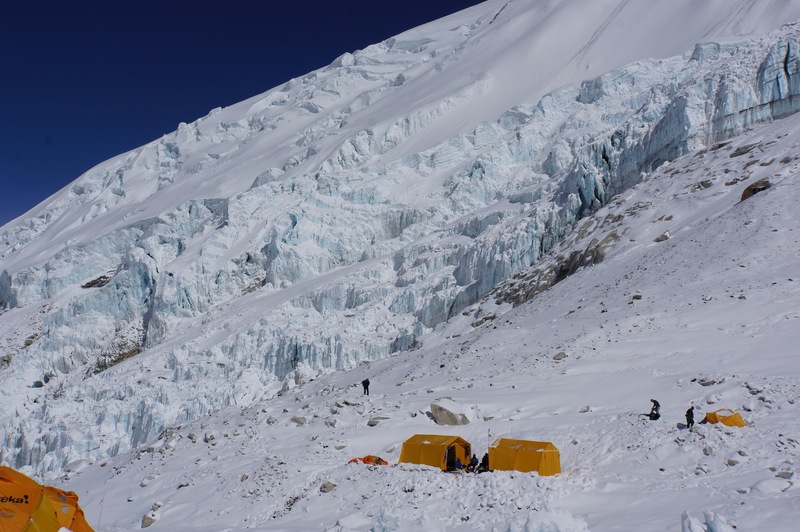 Everest, Geneva Spur, and Lhotse seen from C2. 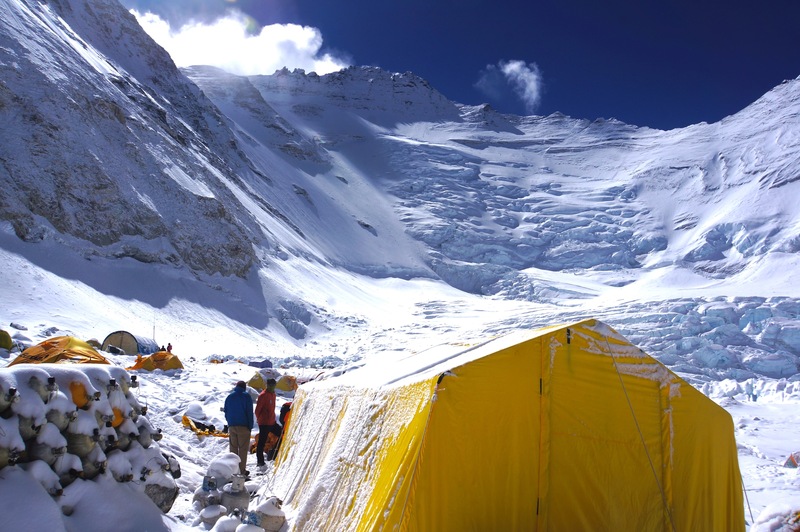 Lhotse cloaked in white, above one of our tents at C2. O2 tanks stacked on the left. 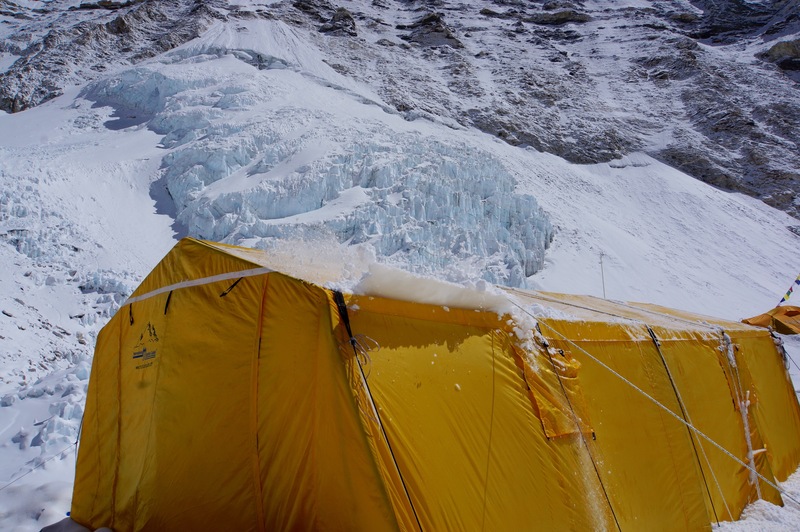 Icefall above the coms / cook tent. 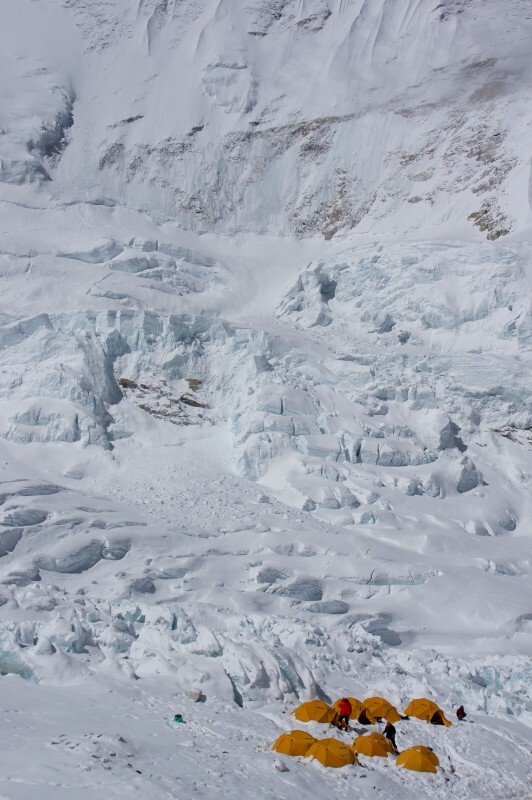 Closeup of some steep, gnarly icefall on Everest’s flank. 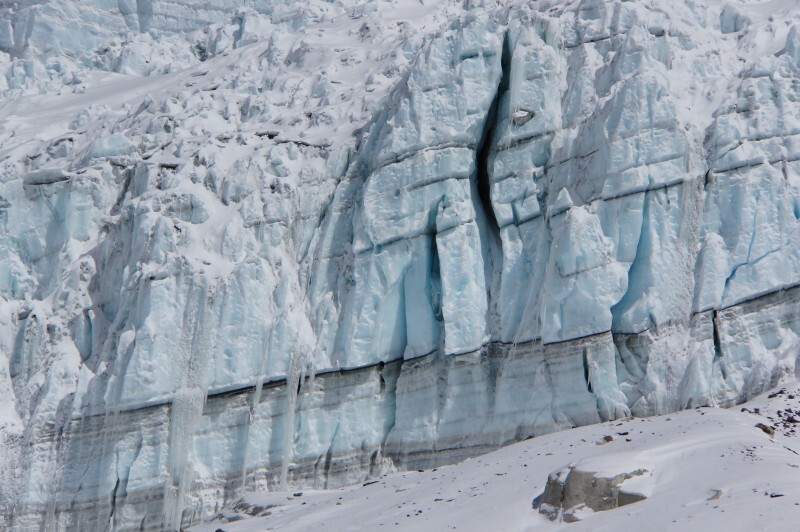 Ragged face of ice cliffs that serve as the bottoms of hanging glaciers on Everest’s West Shoulder. Not sure how much of this was new vs. the day before, because our view was obscured in cloud. I estimate this ice cliff to be 75 feet tall. But, they may have been bigger. 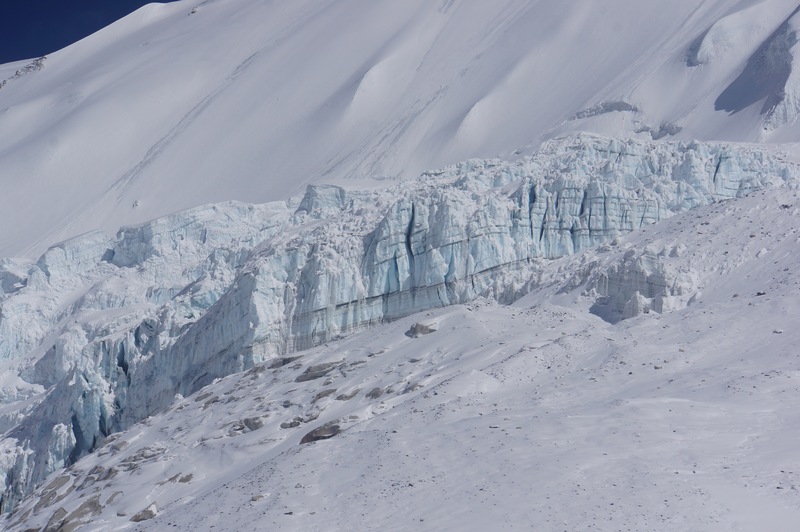 Closeup of the ice cliff in telephoto. Check the boulder trapped in the ice just right of the big crack. 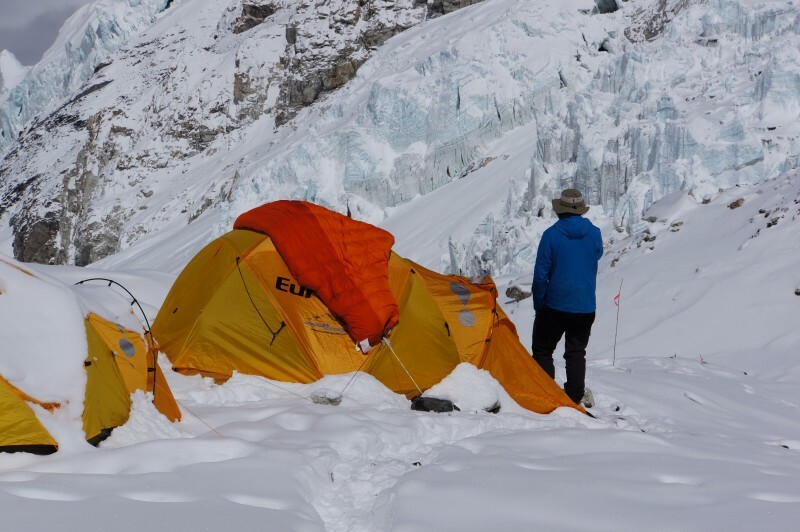 Ice cliffs above another expedition’s camp. Like us, they did not seem to sustain damage in the quake. 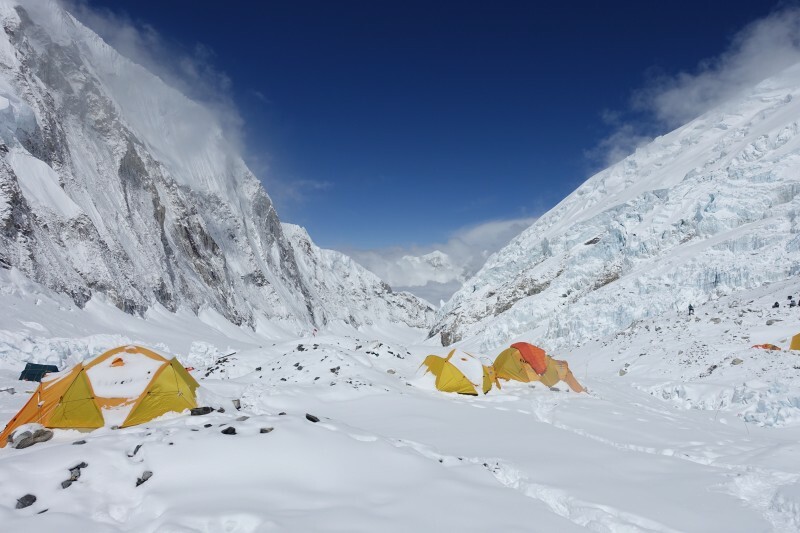 Another team breaks camp across a small valley. Looks like recent avvy activity up there to me. 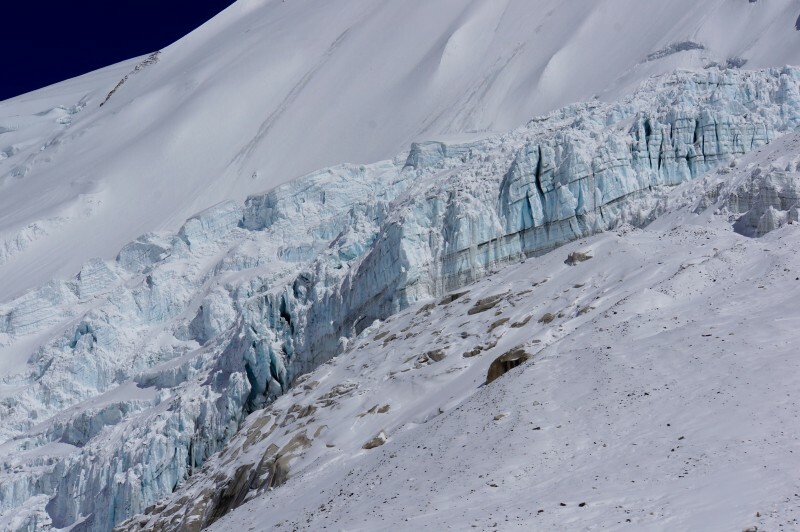 Still plenty of hanging glacier left on Nuptse’s flank. Closeup of Nuptse’s hanging glaciers. David tries to revive his Goal Zero under snowfall. This powered his portable speakers, making music we all enjoyed. 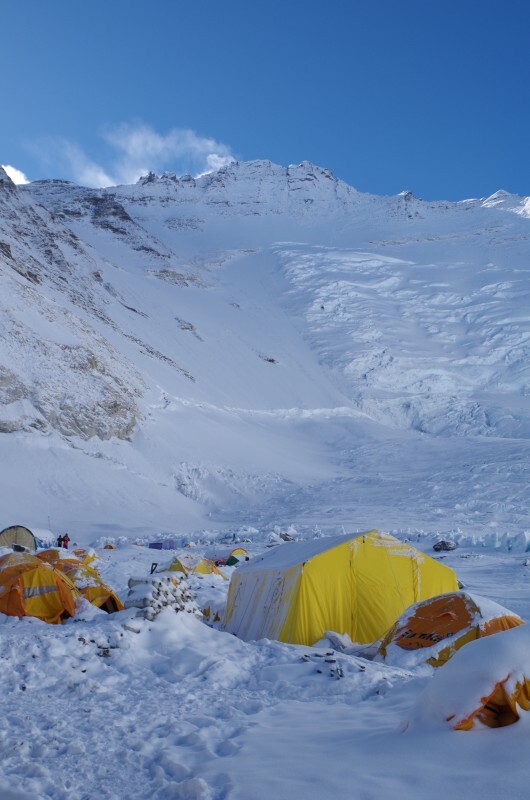 Camp of our friends on another expedition, just down the hill from us, with Nuptse beyond. Some recent avvy activity is evident in the distance. Another camp just below ours. 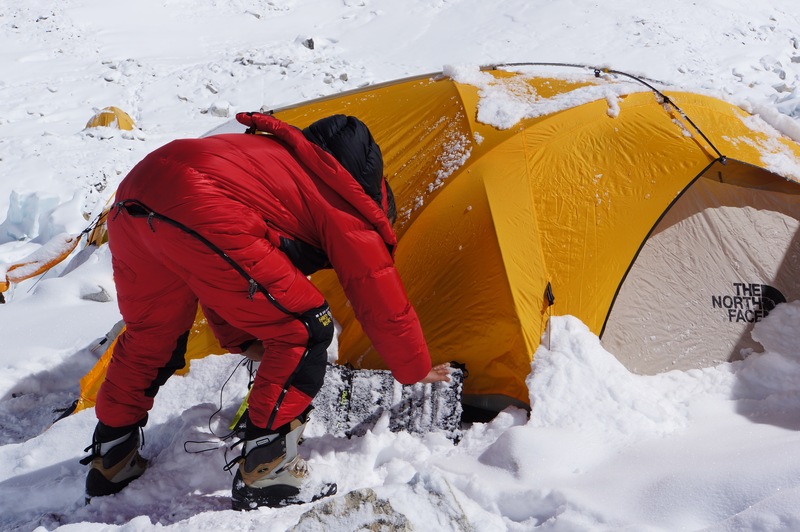 Our team knocking snow from the roof of dining tent. Another meeting was held at our camp with guides from other teams. 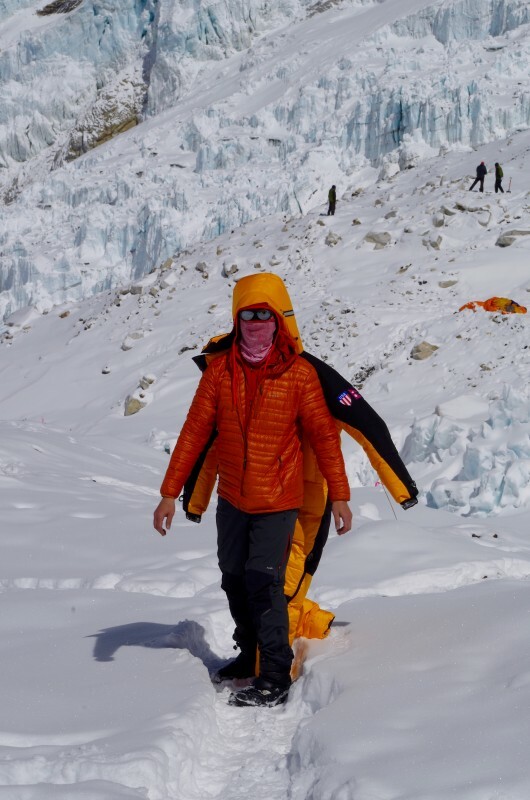 We learned that a climber with HAPE on another expedition needed to be evacuated, as did our Sherpa porter with the knee injury. 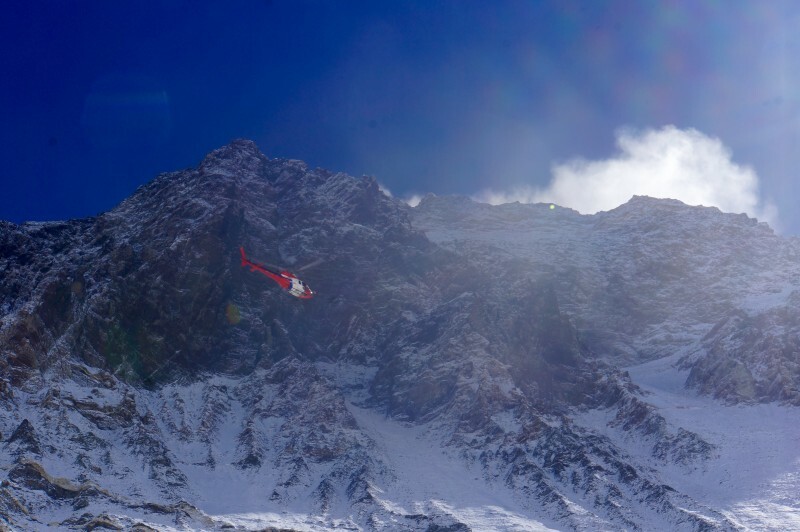 Once cloud cover reduced, choppers began to arrive from down-valley. We watched them quietly as they arrived, one at a time. They emerged from the clouds below, flew over at a steep angle, then settled a couple hundred meters away behind some low seracs. Listening to the radio chatter, I thought I knew which bird was for our Sherpa, and sent him to the LZ as the chopper arrived. It took him longer to hobble over with assistance than I had anticipated, and I was aghast that the chopper left without him. 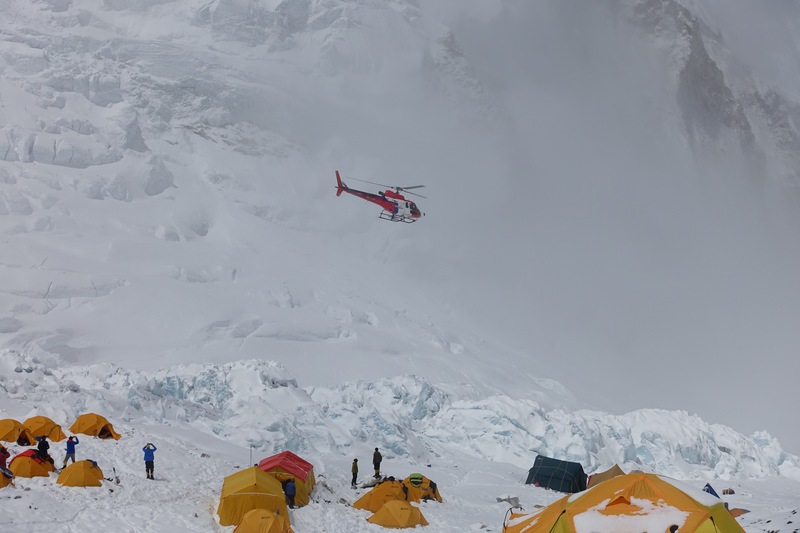 In fact, another climber was evacuated on that flight, and soon thereafter a helicopter arrived for our Sherpa, and all was sorted. 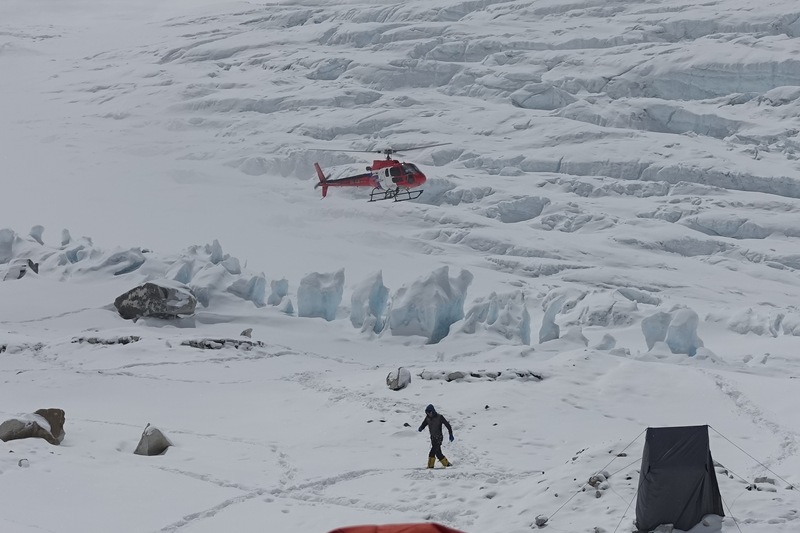 At this elevation, choppers only bring down one climber at a time. 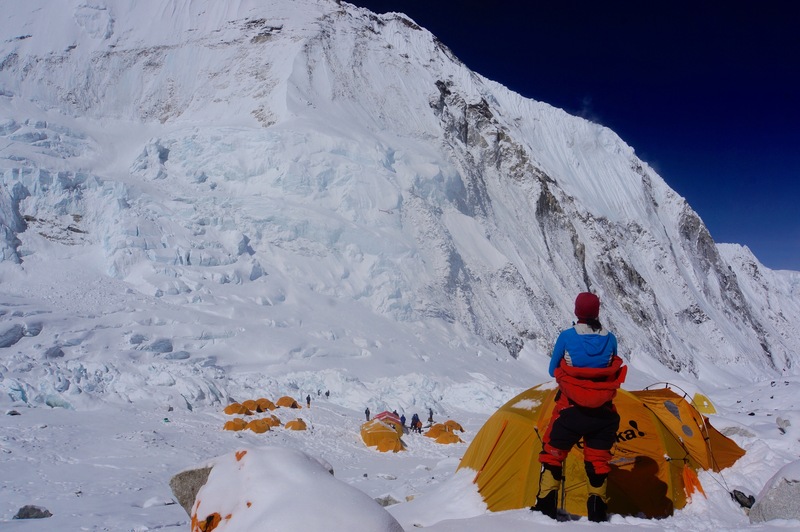 On approach to the C2 LZ, Everest towering overhead. 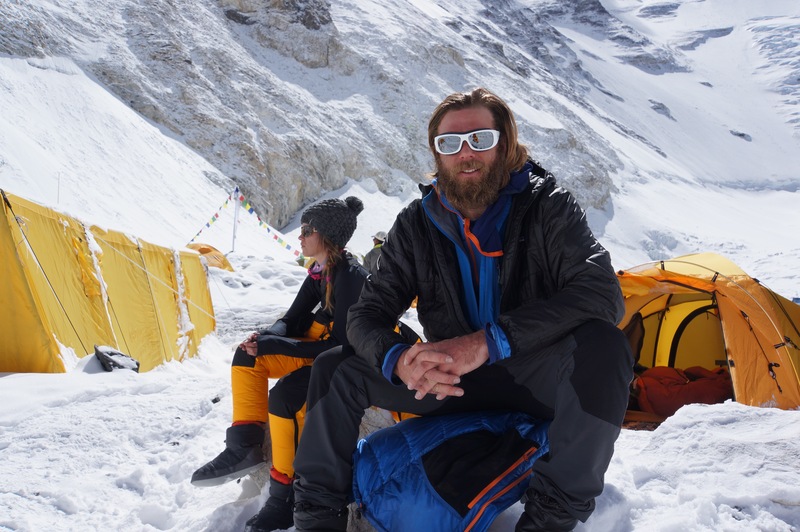 Once our teammate was safely on his way, everyone smiled and attempted to relax. But, anxiety and confusion were undercurrents that could not be ignored. 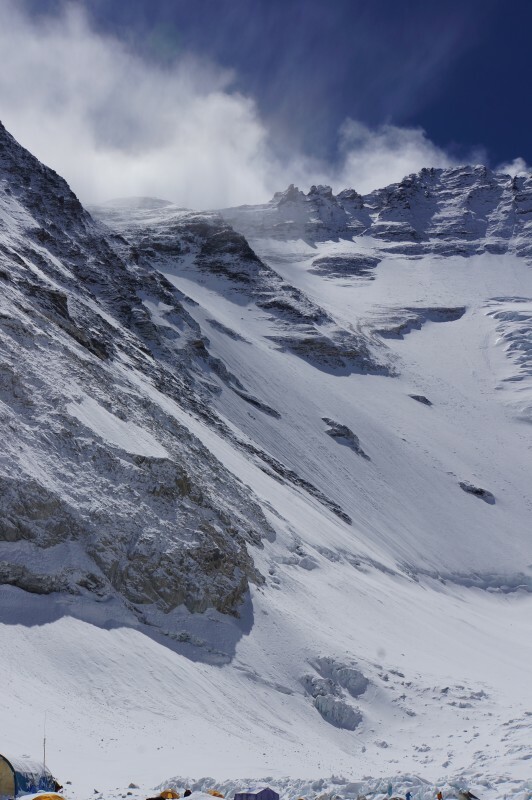 One rumor that I found particularly disconcerting: two Sherpas from another expedition who were trying to reestablish the route to C1 developed HAPE on the way down, leaving them trapped above an impassable crevasse, calling for helivac. Then, word that they had been longlined down. To this day I have no idea whether this story is true, but I doubt it. 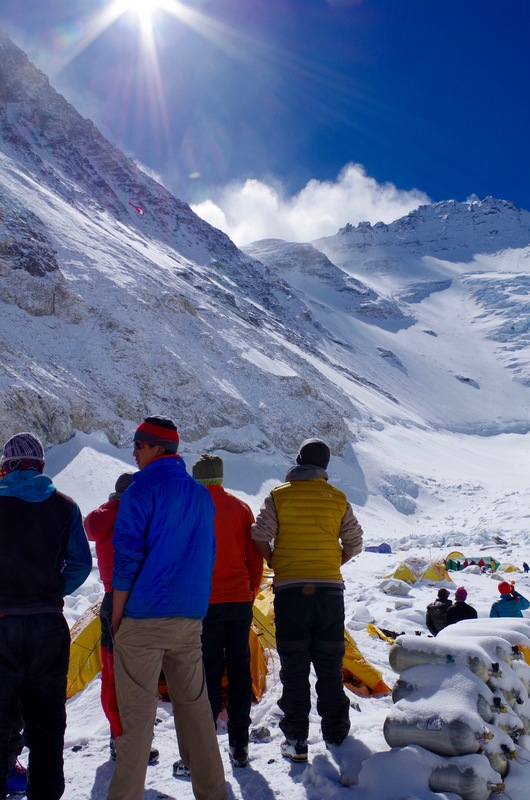 Mountaineering is always full of rumors, incomplete stories, or inaccurate information, and this situation was no different. However, we had the benefit of team leadership that was working hard on our behalf, and we knew that eventually all would be clarified. We could always trust information coming from IMG… everything else was suspect. The biggest question: How will we get down? 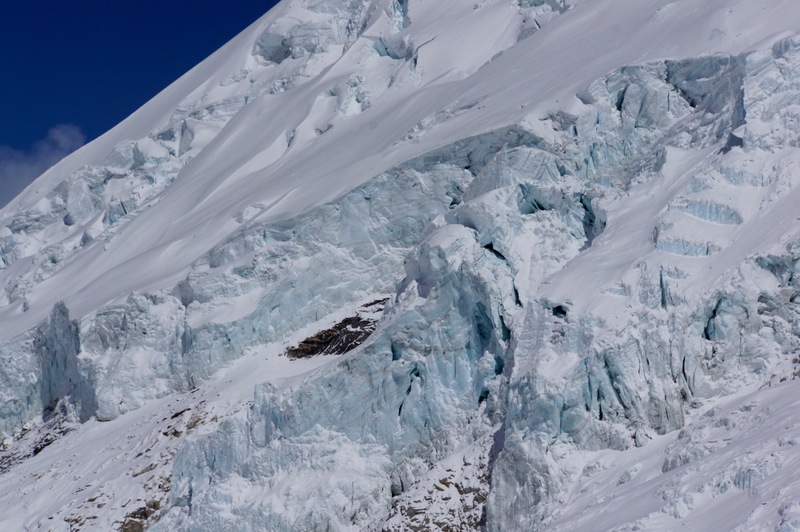 The quake had probably caused the seracs to shift in in the icefall. 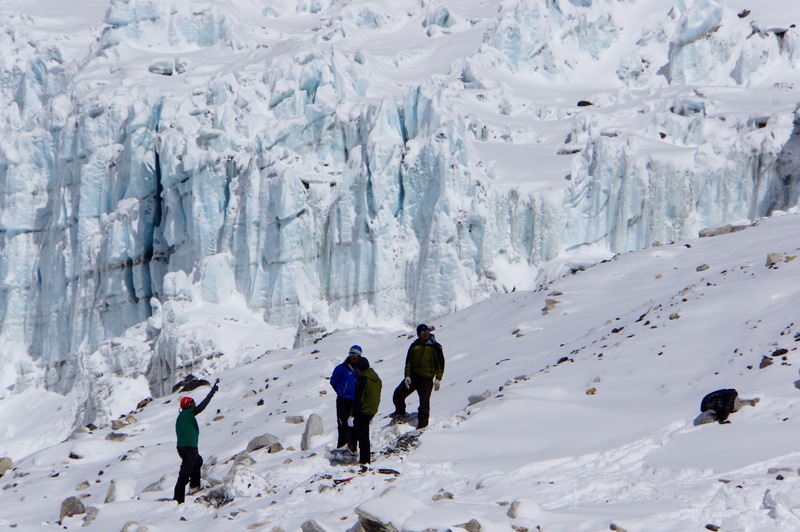 Building a safe route up had taken the icefall doctors weeks. Would this process need to be repeated? One of our amazing guides, Justin, joined two other guides from other teams at C1 and together they tried to make their way down. All of this was totally out of sight from C2, so we waited and waited for news of their progress. At some point in the early afternoon we felt an aftershock: Just a brief jot and shake, but enough to convince everyone that reestablishing the route through the icefall would not be safe. We knew Justin was in there, and worried about him for a moment, until his safety was confirmed via radio. It sure sounded like walking down was out of the questions, at least for now. Blake and my tent gathers rays. The other one was not used during our stay. 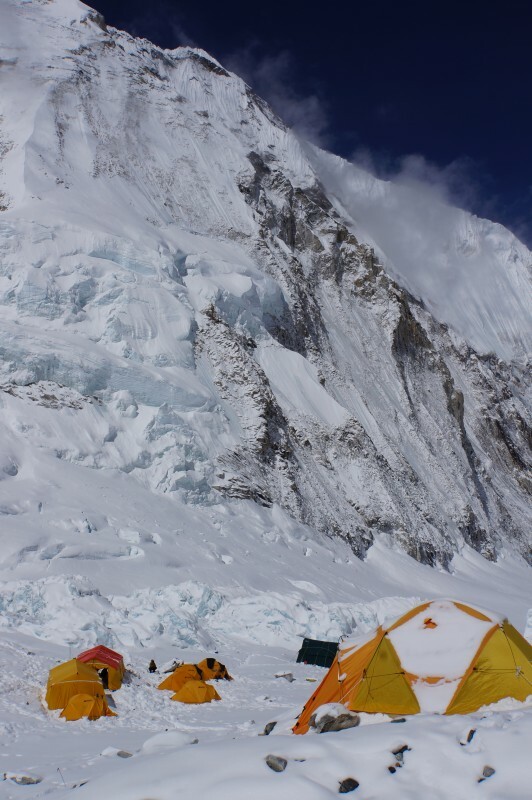 Check out the serac against the horizon, still perched above the route in spite of the prior day’s quake. Looking down the cwm towards C1. Blake’s sleeping bag catches some air on the roof of our tent. After lunch we pulled our thin sleeping mats out of our tents and laid in the dining tent, trying to rest and buoy each others spirits. 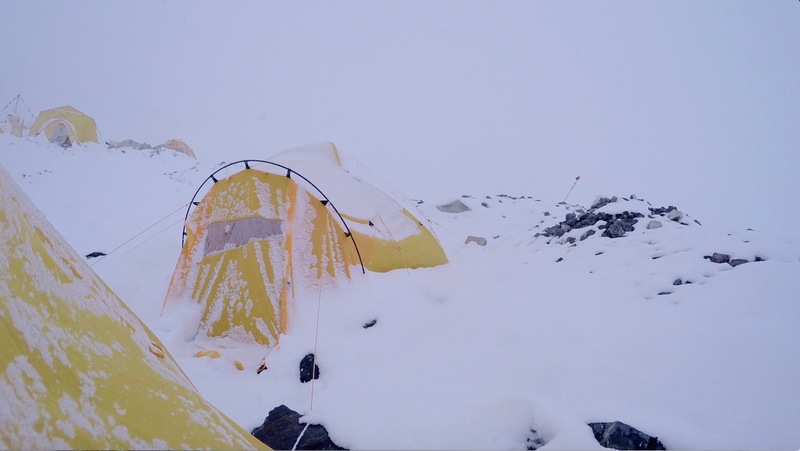 But the bare stone floor was incredibly cold, and when cloud cover returned the dining tent became too cold for comfort, so we retreated to our own tents and sleeping bags. 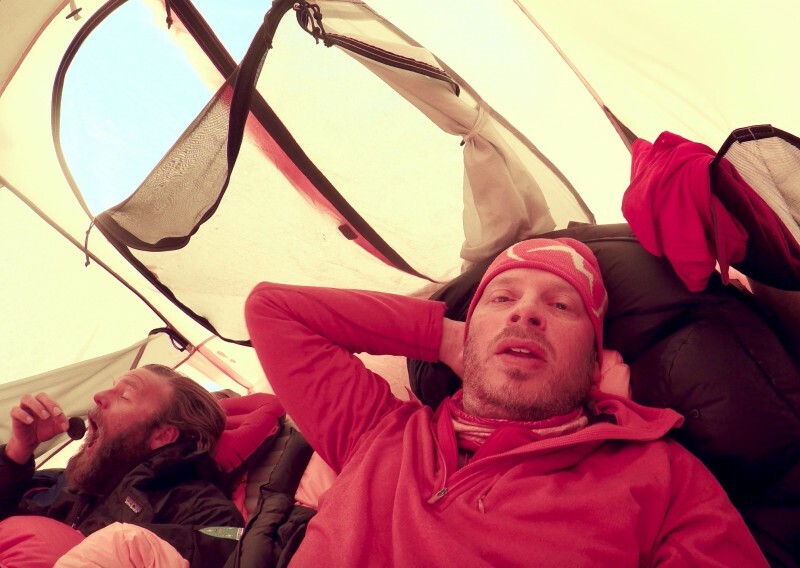 Hard to describe what those hours were like… Physically we were fine, though a bit tired while living at 21,300 feet. But, mentally, we were shrouded in questions and doubts. How will we descend? And, most importantly… Will we return? My teammates, being smarter and more insightful than I by far, seemed to understand that this was the end. 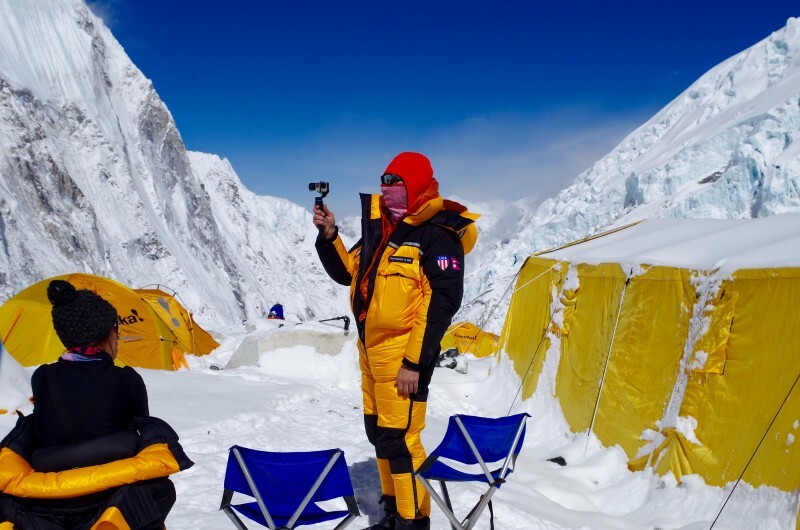 But I simply could not believe that the expedition was over. I kept assessing our situation in my mind and out loud. I am fine. We are fine. The upper mountain is fine. This will be fine. The view from our tent that afternoon. Amazing how quickly things change up there. Blake puts an oreo in its rightful place. We guesstimate the static air temperature: it was 75F, and rapidly on its way below zero. 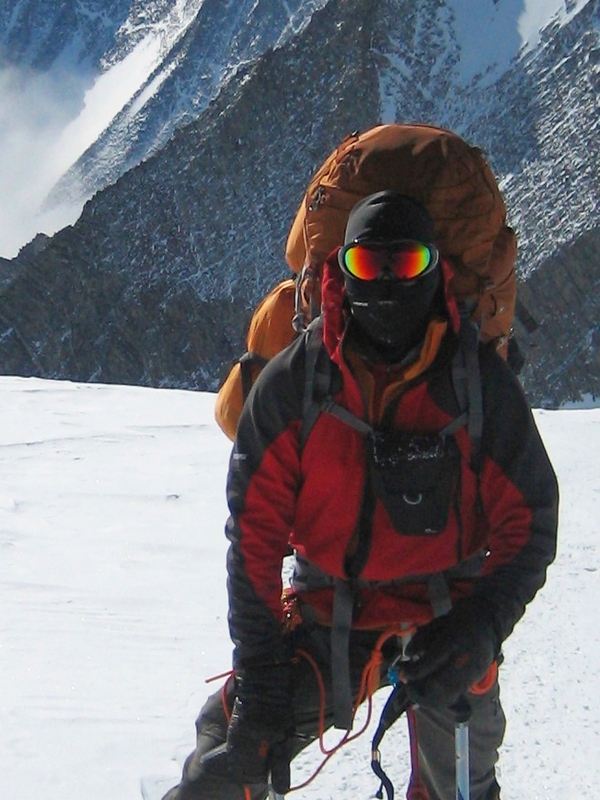 Expedition high point: 21,289 feet AMSL. 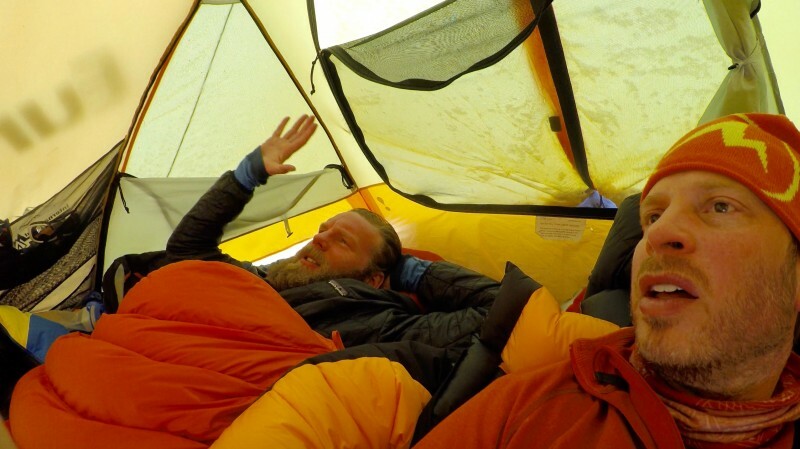 Blake and I had been higher on the summit of Aconcagua, but this was a high sleeping point for both of us. 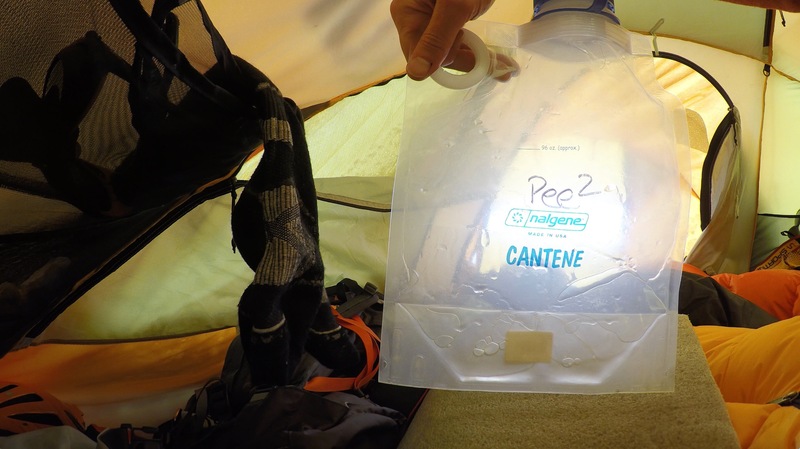 Best piece of gear on the expedition: The Pee Bottle. My beloved Wapiti Woolies cap, headed into storage at C2. During the dinner briefing, our plan became clear: We would rise early, have a very quick breakfast, then head down to C1. 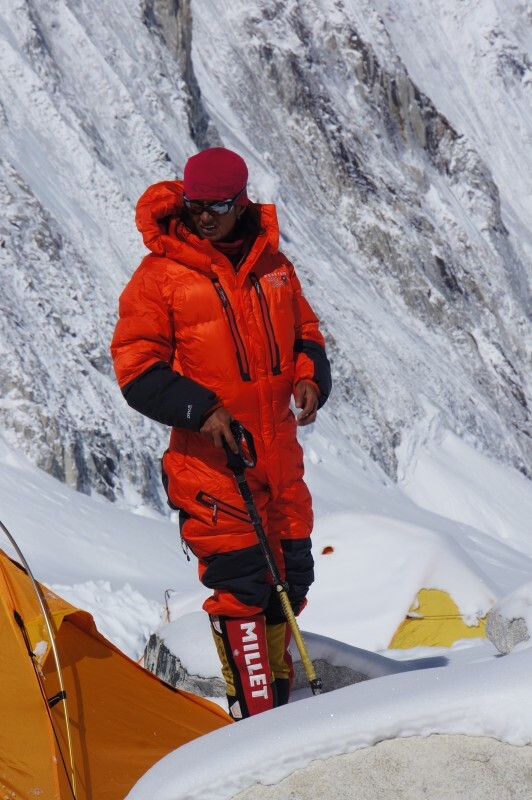 The route had been found passable by other teams that day, although it had not been fully scouted directly by IMG, and so there were some unknowns. 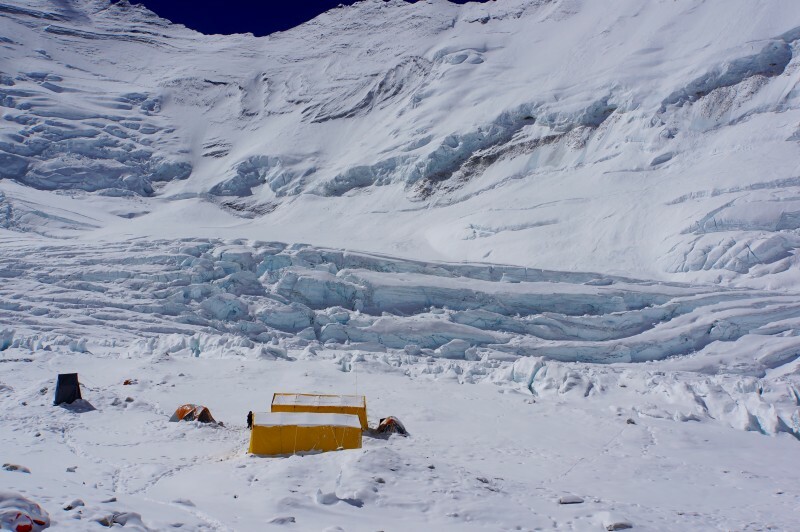 We would travel in roped glacier style, in case of crevasse fall (which is not generally an issue on the route through the cwm, but with the route untested there was no reason to take any chances). 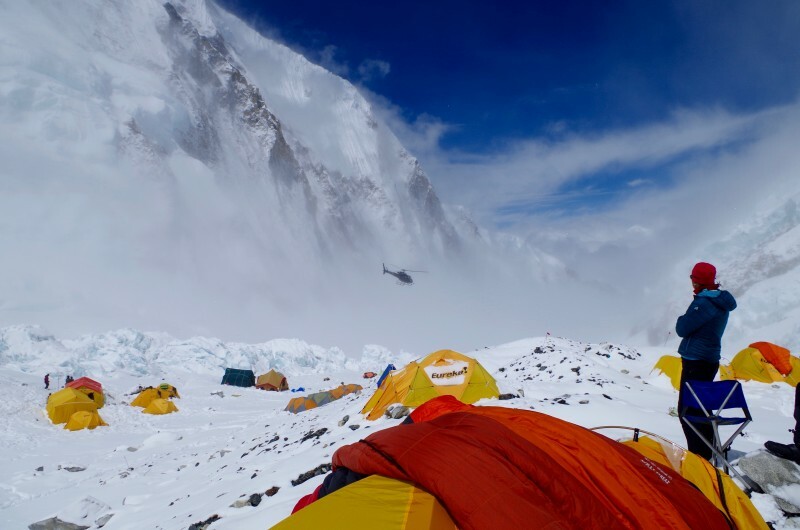 From there we would be evacuated to EBC by helicopter if conditions were favorable. If not, we would wait at C1 for as long as necessary. We spent the afternoon and evening getting our kit packed up. Some gear would be left behind, exactly as planned, for our return a few days later. But, essential survival gear would go down with us, in case we got stuck at C1 in rotten weather. I filled a stuff sack with things I thought I would not need again until the next rotation: Summit mitts. A bunch of high-calorie snacks. My favorite Patagonia long sleeve zip tee. My custom-knit monogrammed Wapiti Woolies hat. My amazing orange Ibex merino wool boxer-briefs. My GoalZero solar panel. Writing this now, all these months later, I admit that I think of that stuff sack often. 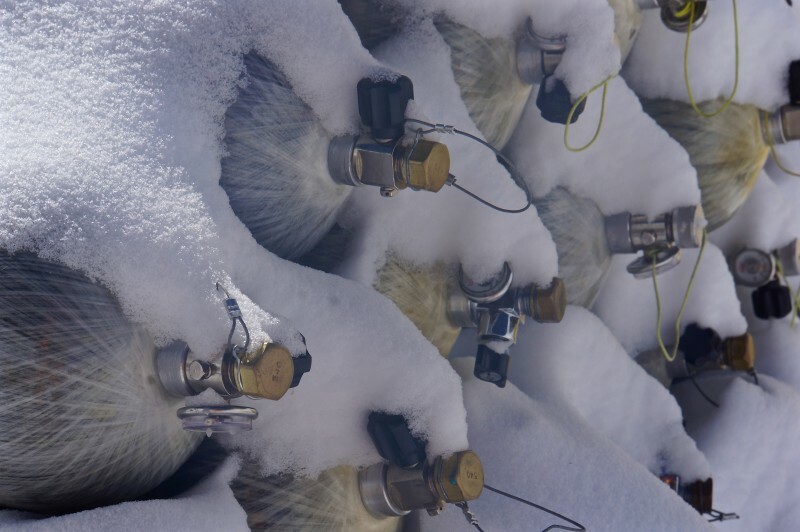 While I am warm, dry, well-fed, happy, surrounded by my loving family… the stuff sack sits at C2. While I am seeing patients, sitting in meetings, commuting to and from work… the stuff sack sits at C2. 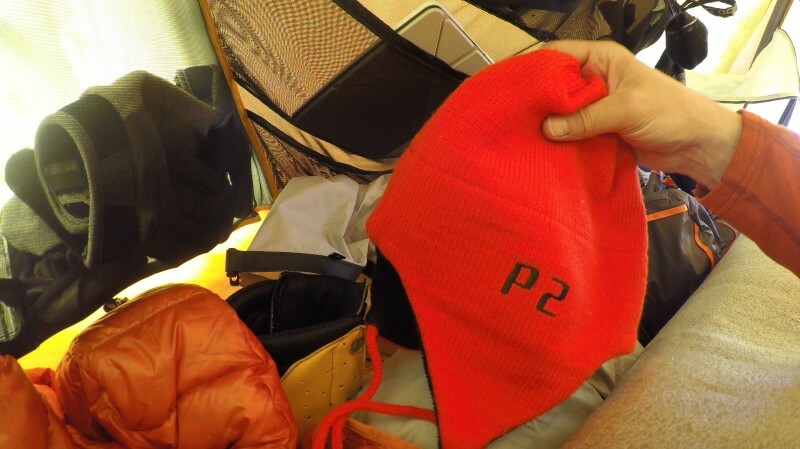 While I am running intervals, climbing stairs, lifting weights… the stuff sack sits at C2. Waiting for me. I shudder to think of its condition, its mold burden, its odor. Is it frozen solid? 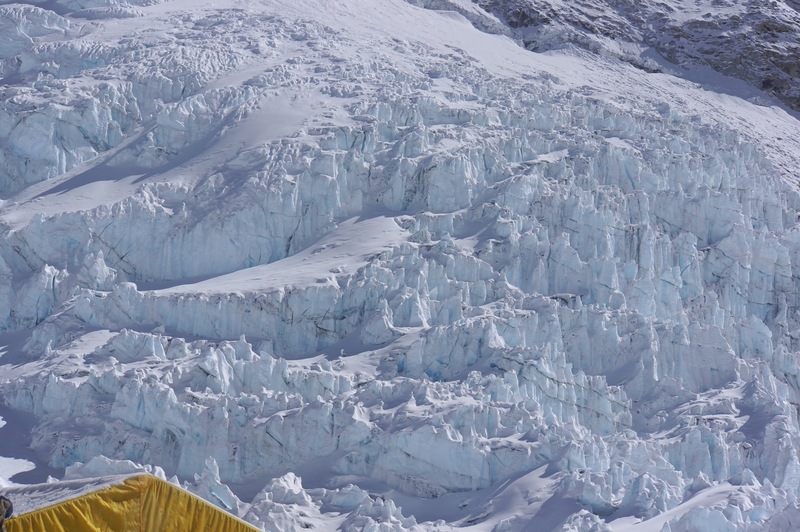 Swept away by avalanches, or swallowed by the glacier? Picked apart by birds? 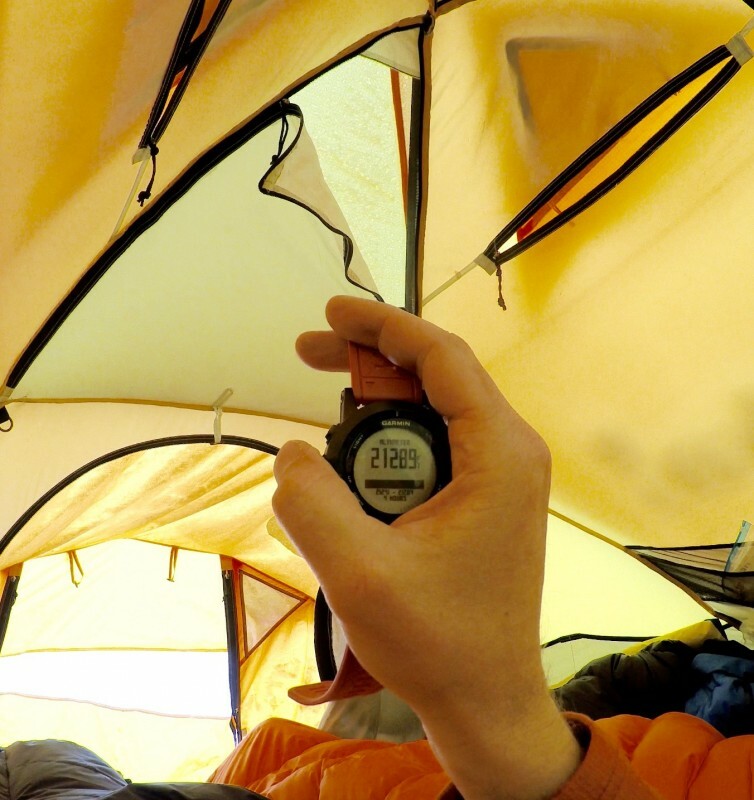 There’s only one way to find out… Regardless, with gear cached there, it feels as though I am still on expedition.